This dashboard, sponsored by the CGAP Open API Program, provides industry information on the availability of open APIs by Digital Financial Service (DFS) and related providers in Africa, East Asia, South Asia and Latin America. Open APIs in DFS are important because they connect third-parties to established financial service providers, essentially turning providers’ platforms into “digital rails” that third-parties can leverage to deliver innovative services that address needs of many customers. The data in this dashboard showcases which businesses are already beginning to open up their digital rails, how they are engaging with third party developers, and what apps and products are being built that are relevant for low income citizens, businesses and households. Prioritizing minimum viable strategies to get started successfully with open APIs. The home page dashboard includes a summary of all current activity from DFS and related providers in regions where CGAP is working to encourage greater financial inclusion initiatives. A full review of the data sources and methodology used to create the CGAP API Dashboard is also available. WHERE ARE DFS-RELATED OPEN APIS AVAILABLE? APIs by Region shows the spread of DFS-relevant API providers globally. Clicking on an individual country shows all API providers with APIs available in that country. You can then click on each company to see more about the size of their developer community, what APIs they have made available, and what developer resources they provide. The number of developers working with each API provider in your geographic market demonstrates the size of the potential developer community that could be building new products and services with your APIs. The type of API products that API providers are currently making available in your geographic market can suggest “table stakes” of what is important to have available to compete effectively, and can help you identify alternative, unique value products that you could offer by filling a gap in the market. The percentage change in number of APIs available and number of companies offering APIs can help demonstrate the dynamics of the market and movement across your industry sector towards leveraging APIs as a business strategy. WHICH DFS-RELATED PROVIDERS HAVE THE ATTENTION OF DEVELOPERS? 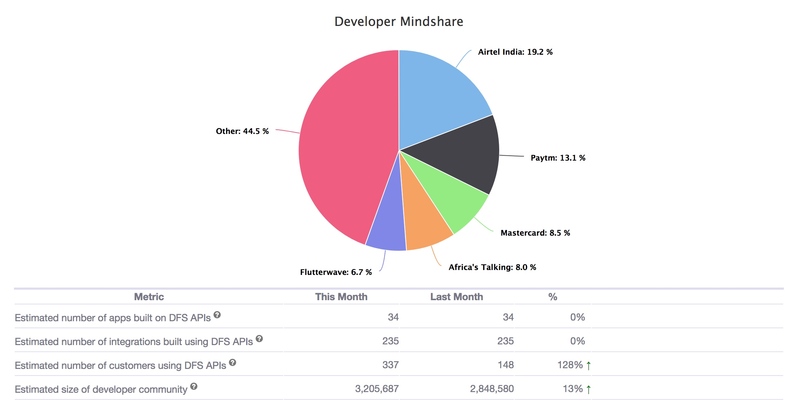 The developer mindshare graph shows which API providers had the largest numbers of developers visiting their API portal in the last month. This data suggests which API providers are connecting with developers most effectively. Analyzing what resources these API providers are making available and what API products have created can help with designing your own API strategy. It is also important to look at what is actually being built using the available APIs. Underneath the graph we have listed the number of available commercial apps (for free or monetized) that we know are built with APIs. A commercial app is a standalone product that makes use of a DFS provider’s APIs. The next row of the table shows the number of integrations that are built with an API. An integration can be a plugin or add-on that is made available so that the API can be used on another platform or within a SaaS product. For example, many payment API providers offer ecommerce plugins so that their API can easily integrate into shopping carts on the most popular online retail platforms. Others provide integrations to connect their API into popular CRM tools. While apps and integrations are built using open APIs, the majority of API consumers make use of an open API to facilitate an internal process. For example, a business may use a payment API as part of their internal payroll processes. These customers make use of open APIs but never release a product externally based on their API usage. Where API providers list the customers or share use cases of who is using their API, we calculate total estimated number of customers using the APIs. The ratio of apps/integrations/customers can be compared with your own data to see if you have a similar profile of usage. WHAT COMMUNICATIONS CHANNELS ARE USED BY THE BEST PRACTICE LEADERS IN THE EMERGING API ECONOMY? When first inviting external developers to start building with an open API, it is necessary to offer a range of support resources to help them onboard and begin making use of your API products. Building a range of developer resources is an ongoing task for many API providers, but with limited initial budget available, API providers need to make decisions about which developer resources to create first. 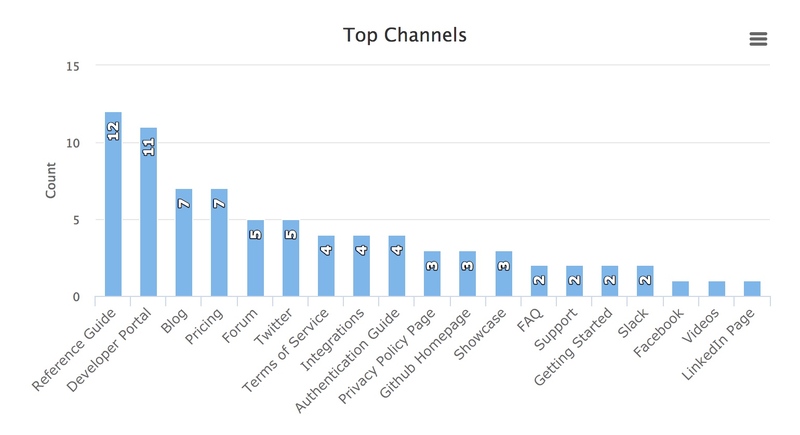 The data in the Top Channels graph shows which developer resources are most commonly created by API providers. By clicking on the three horizontal lines symbol on the right hand corner of the graph, it is possible to download a copy of the graph in a number of formats so that it can be inserted into your business case reports. Low count levels can help identify where you may get a competitive advantage and attract more developers by providing resources that address an unmet need. WHAT TYPES OF APPS AND PRODUCTS ARE BEING BUILT USING THESE APIS? 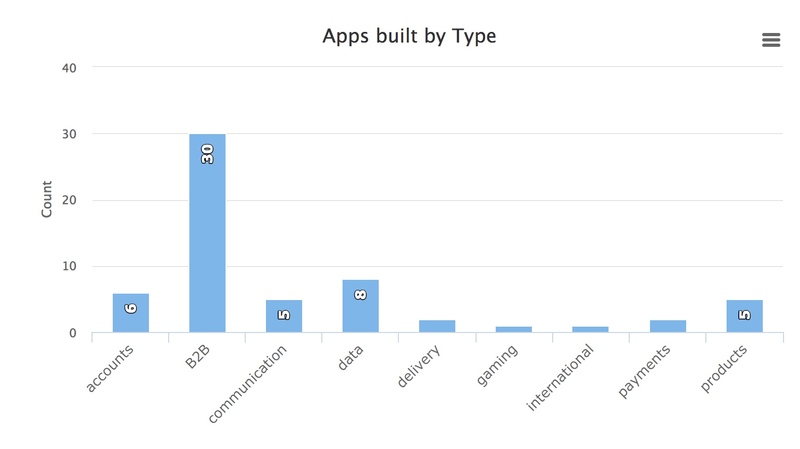 The Apps Built by Type shows the types of apps most frequently built by third party developers using open APIs. They demonstrate the sort of use cases developers are finding for using open APIs. Formats of this graph can also be printed or saved by clicking on the three horizontal lines at the right of the graph. High count levels identify the most popular categories of third party products being built with open APIs? Understanding what types of products are being built can encourage brainstorming and internal thinking about what type of business and pricing models might be most suited to open APIs. HOW ARE API PROVIDERS MONETIZING THESE NEW API PRODUCTS? This data categorizes the most common current business models for APIs by showing tiles of total numbers of APIs with a particular business model. By clicking on the tiles, readers can see what APIs are available categorized by their business model. On the right hand side, APIs are divided into whether they are production-ready, or in an earlier stage of maturity. Underneath these graphs is a recent example of an API that is making use of this business model. Clicking on the example will take you to the relevant API page to allow deeper reflection on why a particular business model was chosen for that API. Counts the revenue model types emerging from open APIs. Reinforces that a business can take a staged approach by quoting data on the percentage of closed and open beta APIs, showing that new entrants don’t need to have a full business plan to start. Identifies industry norms for particular business models based on the type of API product being provided.